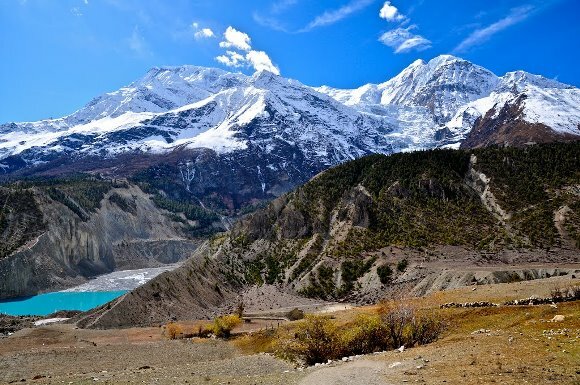 The Royal Annapurna Trek is perfect for beginners or a family adventure. This route gets its name from Prince Charles of Wales, who in the 1980's set out for the shorter and easier version of its cousin. Packed with beautiful scenic views this wondrous trekking experience will take you through the foothills just north of the Pokhara Valley and end at the beautiful Begnas Lake. The trip begins and ends in colorful Kathmandu, Nepal where you will take an exciting flight to/from Pokhara then drive to the village of Bijayapur, where the trek begins through farming villages to Kalikasthan. 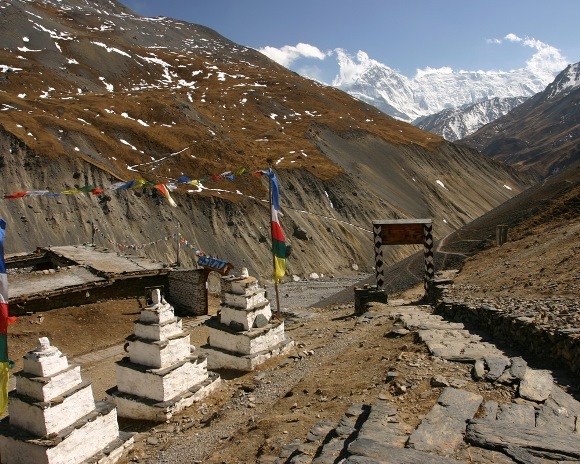 Breathtaking views of Annapurna and Machhapuchre can be seen on the first trekking day. Accommodations along the way are in teahouses and combined tents. Meals are “a la carte,” allowing you the flexibility to eat what you want. Our hand-picked guides are trained and licensed by the Nepal Mountaineering Association to ensure you have a safe and enjoyable trek. In addition, Nepal is home to some of the friendliest people and the most beautiful scenery on the planet so enjoy its variety cultural traditions. Our friendly Ultimate Everest representative will meet you at the airport and drive you to your hotel in colorful Kathmandu. During this meet and greet your guide will discuss the daily activities of your trip. From Kathmandu you take a half hour flight to Pokhara and then drive to Bijaypur; enjoying views of the Nepalese countryside along the way. The trek begins on a level trail and then undulates throughout the day through beautiful evergreen forest of Okhare. Along the way we pass thru the villages of Mastan Saurani, Sundergaon and until reaching our final destination, Patle. The trail roams through a forest and a rolling landscape that leads to the Ozangaun village, here the terrain becomes steep and descends to the village of Lipyani. The hard climb to Syaglung Danda then begins. From the classic Gurung settlement views of the entire Lumjung Himal can be enjoyed. The last day of the trek is spent by retracing our steps to Lipyani, descending the steep stone steps. After crossing a bridge the climb to Lapsi Danda begins. The trail evens out becoming easier as we descend to Begnas. The trek is concluded with a short walk to the bus stop in Begnas. Here you will catch the bus that will drive you back to Pokhara. Head to the airstrip for the return flight to Kathmandu and depending on your flight schedule in Pokhara, you may have a half-day of sightseeing or shopping. Overnight in a hotel in Kathmandu. 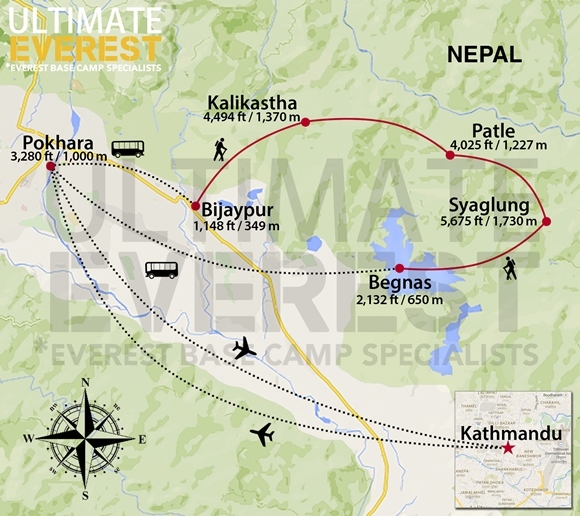 Our Ultimate Everest representative will drive you to the airport in Kathmandu for your return flight home.